When I moved from a small village in SE Ohio Appalachia to a ‘city’ two hours away with 14K people, I missed my hometown. Sure, there was nothing to do and nowhere to go in the village, but it was all I had known. It didn’t take long to get excited about a place that had more than one grocery store and actual restaurants and clothing stores! However, there was one quaint little shop (shack, really…) that reminded me of our make-shift little village and it was called ‘The Cottage’. In this one-room little barn in the back of a home on 3rd Street, there were rows and rows of candy stuffed inside for 25 cents each. The man who owned this candy shop was elderly, flamboyant and had a raspy voice you could barely understand. He had a previous career as a costume designer and in between all of the boxes and jars of candy were wild clothing scattered about that were fit for the opera. If you went into ‘The Cottage’ with five dollars, you would come out with a big bag of assorted candies that would last you at least a week. My parents would find their favorite candies from childhood and my siblings and I could test out their ‘old’ candy or find brand new candy to try. It was FANTASTIC! Food can unite everyone and candy is particularly sweet. I’ve done monthly subscription boxes with food before, but Nostalgic Candy Club Monthly Subscription was my most favorite box ever. Each month, a box filled with old school (yes, because I am now ‘old school’!) candy brings back lots of wonderful memories and it is awesome to try something sweet that I haven’t had for ages or never got to try. 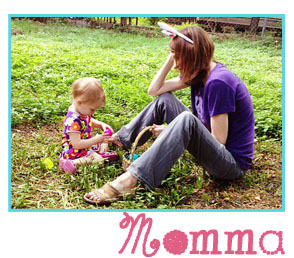 It’s fun to see my girls laugh, try, make-fun, and love the candy that I grew up on in Appalachia. I love that a child in Brooklyn or Los Angeles grew up with the same items to quench their sweet tooth! 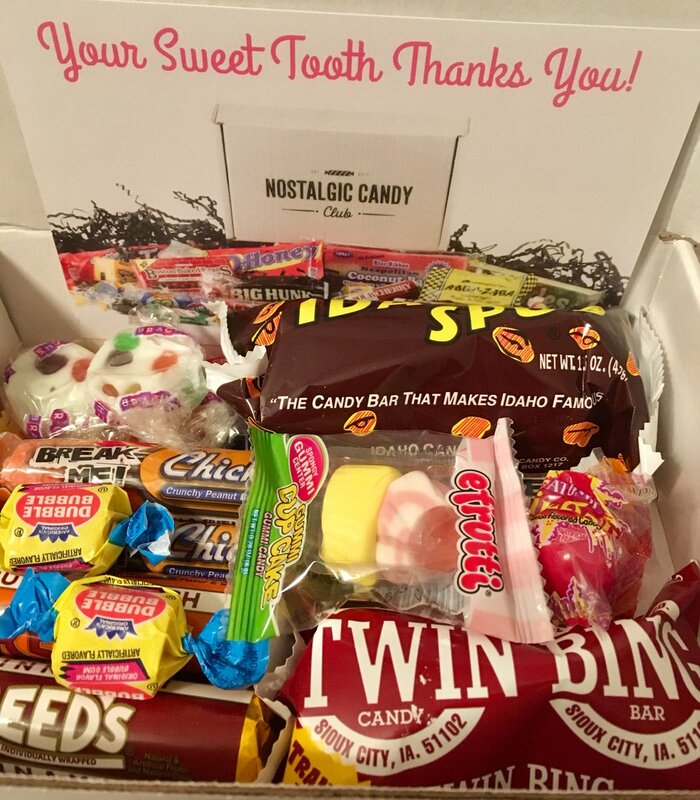 American candy is something that is nostalgic for all of us who grew up in the United States so Nostalgic Candy Club Monthly Subscription is the perfect gift or treat for your favorite adult who loves (and can still EAT) candy. I was so excited when my Nostalgic Candy Club box came and immediately opened it up to check out the goodies inside. I was really excited to see Chick-O-Sticks in the box. That was the candy I would get at the swimming pool’s snack bar when I was young. The box included a card with information about specific candy in the box that included the state of origin and background. 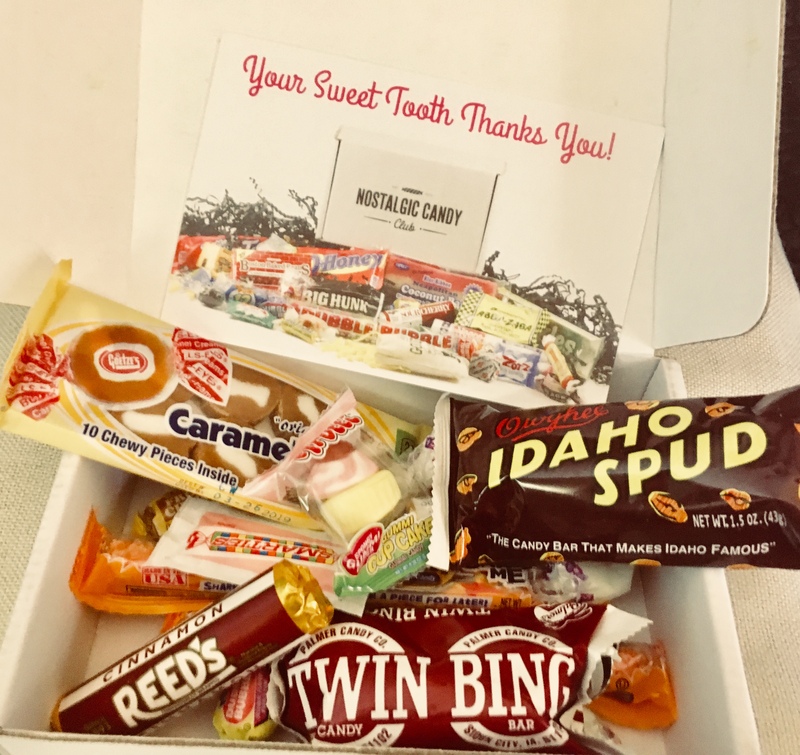 Idaho Spud Candy Bar was created in 1918 and is one of the most popular selling candy bars in the country! The card also included a ‘Fun Fact’ about Tootsie Rolls. I was most impressed that the box included candy I had never tried. GASP! The Twin Bing Candy Bar from Sioux City, Iowa is made by the Palmer Candy Co since the 1920s and is made with a cherry flavor. I had also never tried Reed’s Hard Candy Rolls from Chicago, Illinois and has been produced in the United States for over 100 years! Where have I been?!? This butterscotch treat is decadent and it’s fun to know it has been around since 1893. Wow! All in all, this was a fun subscription box that warms the heart as well as your stomach. Love! Satisfaction is guaranteed or your money back. Subscription plans automatically renew, and you can cancel at any time.